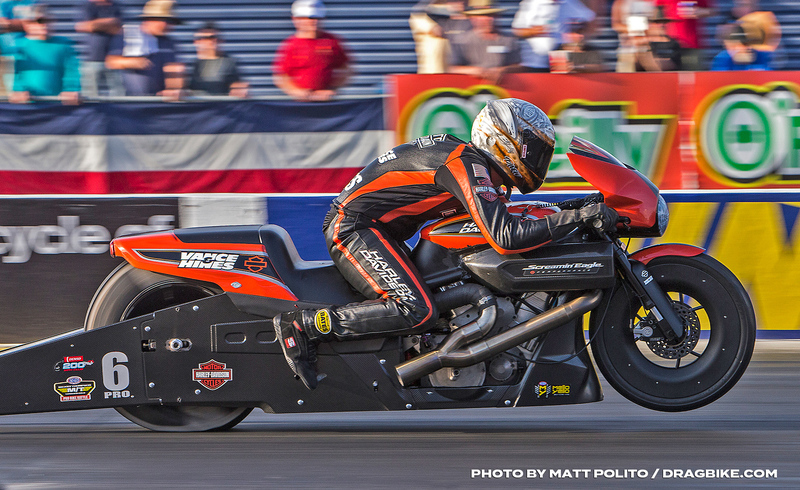 Pro Stock Motorcycle season officially kicks off; favorites, Hines, Krawiec, Smith, and Arana Jr. advance to round two. Arana won this race in 2009. is 6 – 3 against Arana in prior events. Arana’s bike stumbles as soon as he hit the throttle. He recovered but had already pulled away. makes a decent pass but slows from his qualifying attempts. Sampey won this race in 1999, 2003 & 2006. Sampey is 2 – 1 against Gladstone in prior events. Gladstone gets out of the gate first and starts to extend his lead. Sampey starts making up ground about 330 feet out but couldn’t reel him in. Joey Gladstone’s incremental margins: 60ft(0.158), 330 ft(0.161), 660ft(0.145), 1,000ft(0.135). MOV: 0.1292 seconds (approximately 37 feet). Stoffer won this race in 2007 & 2015. This is the first time Stoffer and Oehler have faced each other in eliminations. Stoffer gets the holeshot, stays in front to half track, then Oehler reels her in and goes around for the win. Ryan Oehler’s incremental margins (negative if behind): 60ft(-0.050), 330 ft(-0.026), 660ft(-0.007), 1,000ft(0.008). MOV: 0.0193 seconds (approximately 5 feet). Hines is 5 – 1 against Reed in prior events. Reed takes a shot at the tree and loses. He turns on the red light and gives Hines the win. Hines goes down the groove with a good pass and will have lane choice over in the next round. Arana Jr. won here in 2013. Arana Jr is 2 – 1 against Clontz in prior events. Arana gets the advantage off the line and extends his lead all the way through the run. Clontz may have spun a little at the hit and slowed. Hector Arana Jr’s incremental margins: 60ft(0.079), 330 ft(0.084), 660ft(0.113), 1,000ft(0.136). MOV: 0.1645 seconds (approximately 46 feet). Arana Jr. will have lane choice over Oehler in the next round. Angie gets out of the gate first but Matt caught her before they reached the sixty foot mark. Matt goes right down the groove with a good pass to take the win. Matt Smith’s incremental margins: 60ft(0.009), 330 ft(0.010), 660ft(0.019), 1,000ft(0.029). MOV: 0.0358 seconds (approximately 10 feet). Matt will have lane choice over Gladstone in the next round. Eddie Krawiec’s 6 wins here are the most for any motorcycle rider. He is the defending event champion and has won this race three years in a row. John Force and Warren Johnson are the only two pro drivers to have won this race in four consecutive years. Eddie is 12- 0 in round 1 here and he starts the day with 400 round wins. Krawiec is 17 – 1 against Pollacheck in prior events. Pollacheck gets a little holeshot, stays in front for the first sixty feet, then the bike starts drifting to toward the centerline and he has to start leaning on it to get it back in the groove. Krawiec goes around him and pulls away for the win. Eddie Krawiec’s incremental margins (negative if behind): 60ft(-0.012), 330 ft(0.050), 660ft(0.097), 1,000ft(0.128). MOV: 0.1576 seconds (approximately 44 feet). This is the first time Surber and Underdahl have faced each other in eliminations. Surber leaves a little too soon and goes red giving the win to Underdahl. Underdahl hits the throttle and breaks, coming to a stop around half track. Underdahl gets the win but will give up lane choice to Krawiec in the next round. 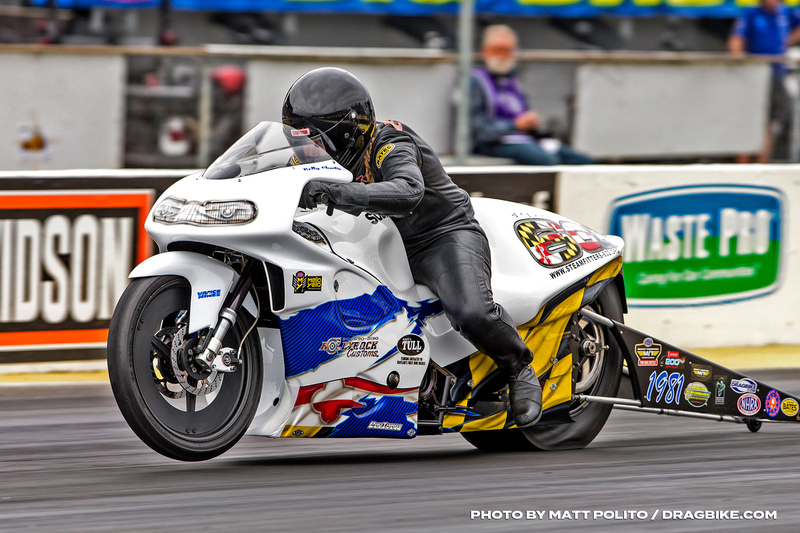 Three of the top four qualifiers advanced to the semifinals or Pro Stock Motorcycle, but Matt Smith wasn’t one of them. 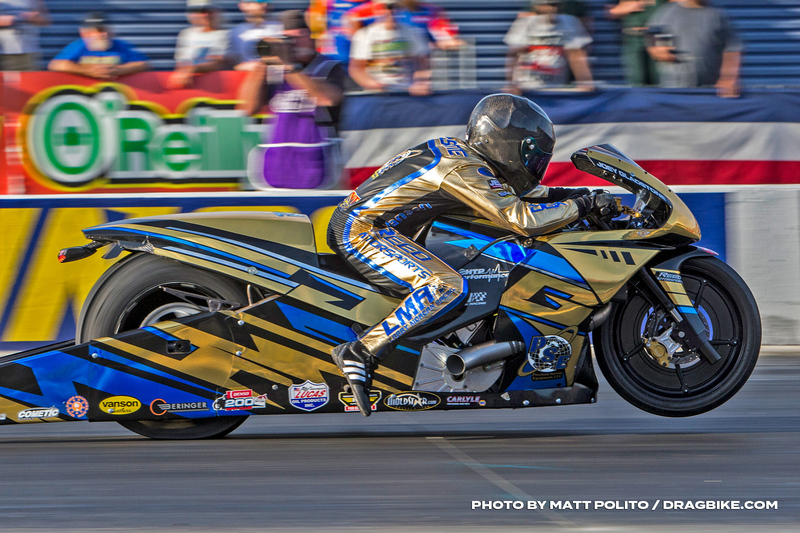 Three of the top four qualifiers advanced to the semifinals or Pro Stock Motorcycle, but Matt Smith wasn’t one of them. The reigning world champ’s Denso EBR sat silent on the starting line while opponent Joey Gladstone blasted to the semifinals. Smith later admitted that his bike had no oil pressure, so he didn’t want to risk a potential catastrophe. Eddie Krawiec almost suffered a similar fate after his Harley-Davidson bogged. Krawiec got a reprieve when Jimmy Underdahl’s Suzuki slowed before the finish line. Andrew Hines and Hector Arana Jr. had no sure issues with solid 6.7-second runs to move on. Oehler gets out of the gate first but Arana reeled him in before they reached the sixty-foot mark. Krawiec is 13 – 1 against Underdahl in prior events. Krawiec hits the throttle and the engine bogs. Underdahl starts pulling away and stays in front to the 1000 foot mark. underdahl’s bike blows the engine just before that point and krawiec is able to get around him and take the win. Eddie Krawiec’s incremental margins (negative if behind): 60ft(-0.078), 330 ft(-0.087), 660ft(-0.077), 1,000ft(-0.009). MOV: 0.2388 seconds (approximately 54 feet). Smith stages, the lights come down and he never moves. He stated that the oil pressure light was on and he did not want to risk blowing the engine. Gladstone makes his quickest pass of the weekend and he will have lane choice over Krawiec in the next round. Hines is 12 – 8 against in prior events. Savoie leaves too soon and goes red giving the win to Hines. Hines will have lane choice over Arana Jr. in the next round. Andrew Hines is one round away from ending a winless drought that goes back more than a year. The problem is that in order to do it, he’ll have to go through his Harley-Davidson teammate, Eddie Krawiec, who hasn’t lost a round in Gainesville since 2015. Hines continued to throw down solid numbers with a 6.758 in his semifinal win against Hector Arana Jr., who fouled. 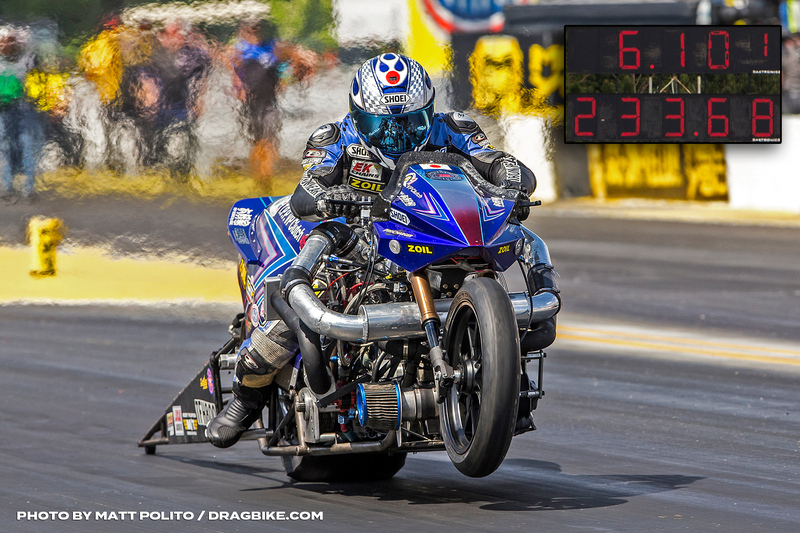 Krawiec was slightly off the pace with a 6.819, but that was enough to defeat Joey Gladstone, aboard Cory Reed’s EBR-bodied V-twin. Weather conditions: air temperature 66 degrees, relative humidity 64 percent, barometer 29.85 inches, adjusted altitude 1,168 feet, track temperature 83 degrees. Gladstone with a slight starting line advantage and the lead until around 800 feet when Krawiec chased him down for the win. Eddie Krawiec’s MOV: 0.0236 seconds (approximately 7 feet). He is advancing to his 79th final round. Arana goes red to give Hines the win. Hines with a great pass and he will have lane choice over his teammate in the final. This is his 87th final round in his career. Going an entire season without a win clearly didn’t sit well with five-time Pro Stock Motorcycle champion Andrew Hines so he decided to do something about it. In one of the most inspired performances of his career, Hines earned his 49th career win at the 50th annual Amalie Motor Oil NHRA Gatornationals. 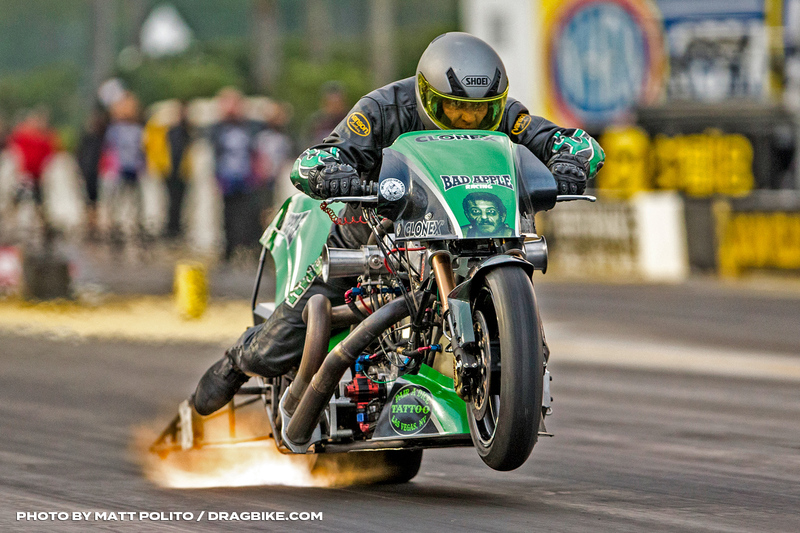 Racing teammate and six-time Gainesville winner Eddie Krawiec in the final round, Hines powered to a 6.752 to barley edge Krawiec’s 6.762. Krawiec had won 15-straight rounds at Gainesville Raceway dating back to 2016. Hines also topped 199-mph numerous times over the weekend, including a career-best speed of 199.94 in qualifying. Krawiec is 31 – 20 against Hines in prior events and Krawiec is 14 – 9 against Hines in prior final rounds. 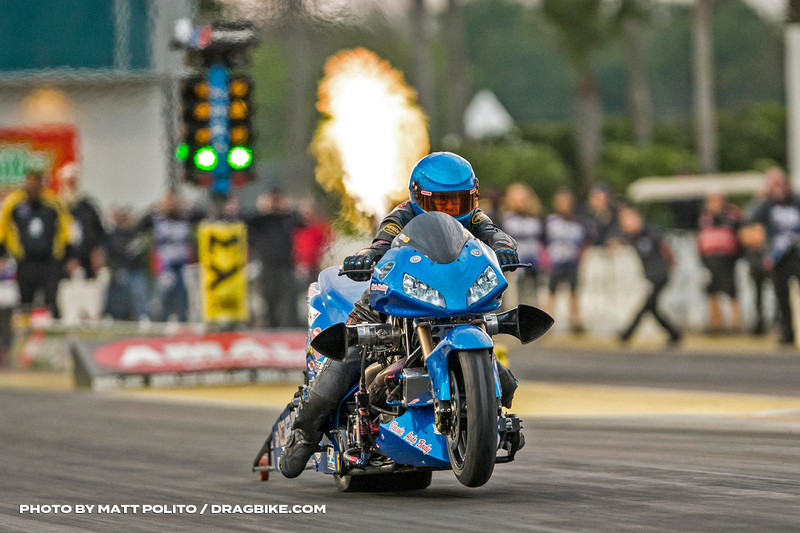 This is the third consecutive Gatornationals final round with these two, and Krawiec has won the last two years. Hines with a tick advantage on the tree and never trailed for the win. Andrew Hines’ MOV: 0.0111 seconds (approximately 3 feet). 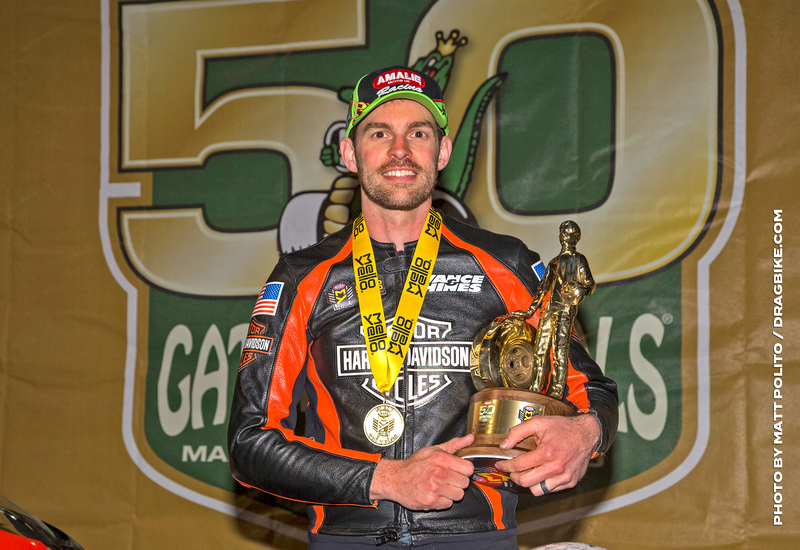 Hines didn’t win a Wally last year and he wins his 49th Pro Stock Motorcycle Wally. Defending world champion Matt Smith took the top spot after driving to 6.753 at 200.95 run on his Elite Performance/DENSO Auto Parts/Stockseth EB during the first qualifying pass of the day. 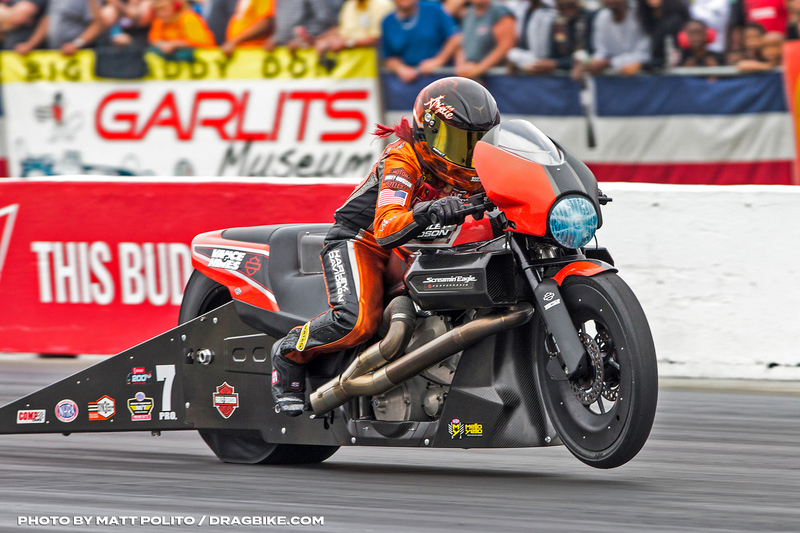 Smith did not qualify for this event in 2018 and seeks to change history at the season-opening event for Pro Stock Motorcycle. 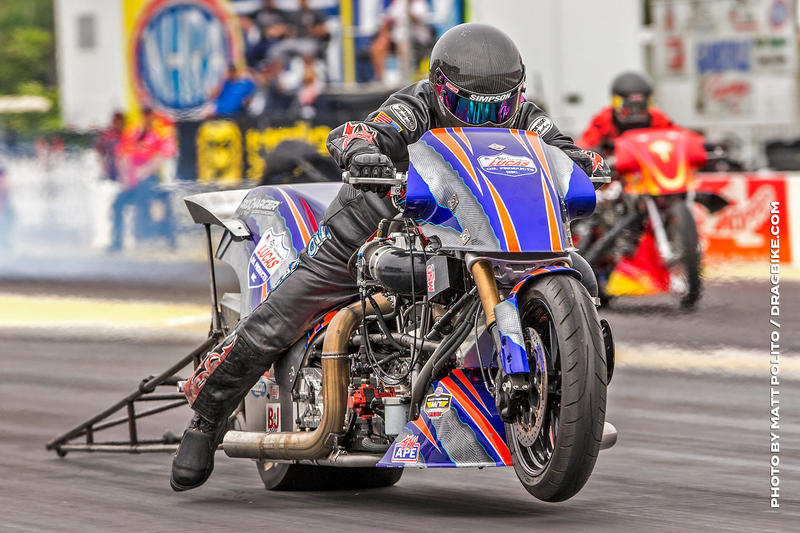 Eddie Krawiec qualified second in the field with a 6.792 at 199.91 on his Screamin’ Eagle Vance & Hines Harley-Davidson Street Rod while his teammate Andrew Hines rounds out the top three. But the big news in qualifying was the Side by Side 200 MPH passes by Matt Smith and Eddie Krawiec. Smith’s MPH sets the national record while Krawiec’s MPH is a career best for him. As eliminations began, Beau Layne Vs Mike Scott was the first pair out with Beau Layne getting the better of Mike, 6.29 to Scott’s 6.47 elapsed time. The 6.29 was a career best for Beau. Then in very important match up, Bobby Malloy was poised to face off against national #1 Tii Tharpe. Tii really needed this round win to gain in championship NHRA points. Bobby Malloy launched off the line first with Tii .023 seconds behind in his reaction time. Tharp then executed his quickest pass of the weekend, posting a 6.23 seconds, ET. However Bobby Malloy posted his quickest pass of the event with a 6.20 ET that gave Bobby a margin-of-victory by .054 seconds. 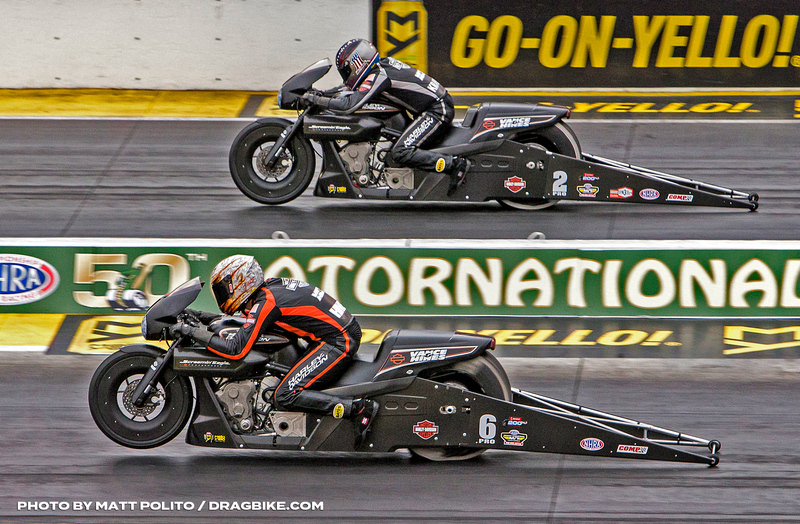 Tii’s exit first round made the Doug Vancil Vs Ricky House match up next – one of great importance as with Tii going out in round one, if Vancil were to advance rounds, this would yield huge gains for the Vance & Hines team. However Rickey House, who is long overdue for a win, suddenly emerged from the shadows. Doug launched hard, as he always does, with a .041 RT, then posted a very stout 6.23 ET. This combination is good enough to beat 95% of the T/F bikes currently in NHRA competition. However it was not enough to overcome the numbers posted by Ricky House of Texas. Ricky just dropped a house on Doug by vaulting off the line with a .015 RT, then stormed down the track with a 6.20 @ 225 MPH pass. He went thundering by Doug Vancil just before the finish line. The MOV = .051 seconds. Knowledgeable Harley fans watching were shocked as both big guns went silent, as they exited the race in the first round. For the final match-up of this round of racing, Tak Shigematsu and Jake Stordeur lined up for a good drag race. They left the line together and traded the lead thundering down the track with Tak pulling ahead just before the finish-line. “The man from Japan” won the duel 6.75 to 7.02, but then just as the bikes crossed the finish-line Ka-Boom: Tak’s motor let go, sending pieces of the engine block to parts unknown. Unfortunately for Tak Shigematsu; he won the battle but lost the war as he didn’t have a spare motor to plug into the bike. So word was sent to race control he would not make E-2. 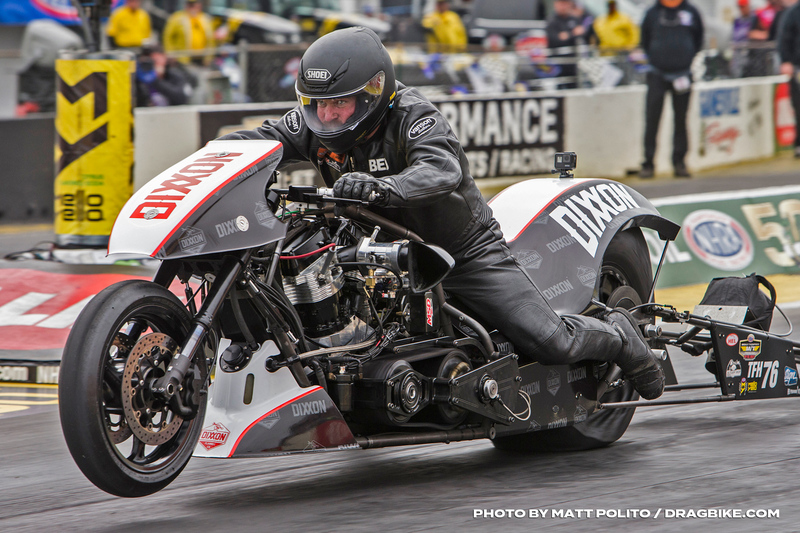 At the start of second round of eliminations for the Top Fuel Harley bikes, Beau Layne was ready for the call, but Tak Shigematsu was absent due to a windowed block. So Beau took the competition solo pass, putting him into the final round, for the second consecutive race of 2019. 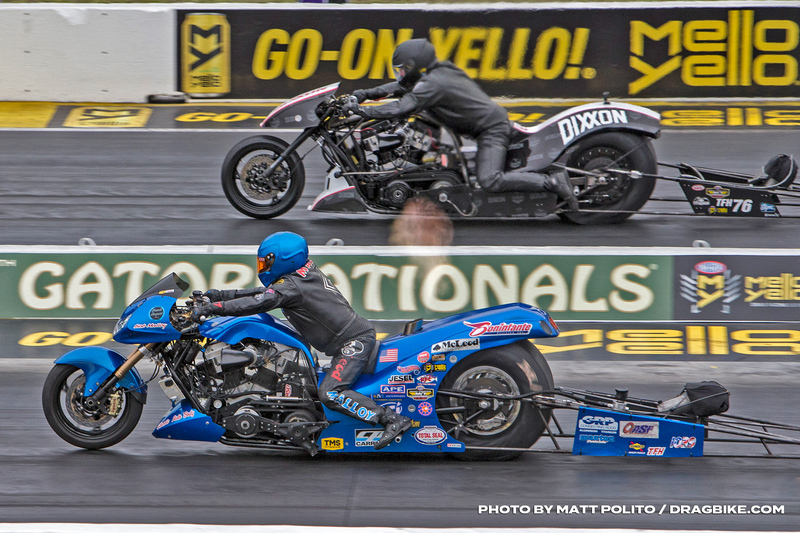 The other match up during E-2, Ricky House Vs Bobby Malloy: Ricky left the starting line hard but within a matter of feet, his Magic Dry – Cat Spot, Top Fuel Harley suffered a mechanical glitch and it slowed to an idle speed. Meanwhile in the left lane, Bobby Malloy thundered away to victory and his first trip to the finals in 2019. When that final round battle took place, many NHRA fans were on their feet. 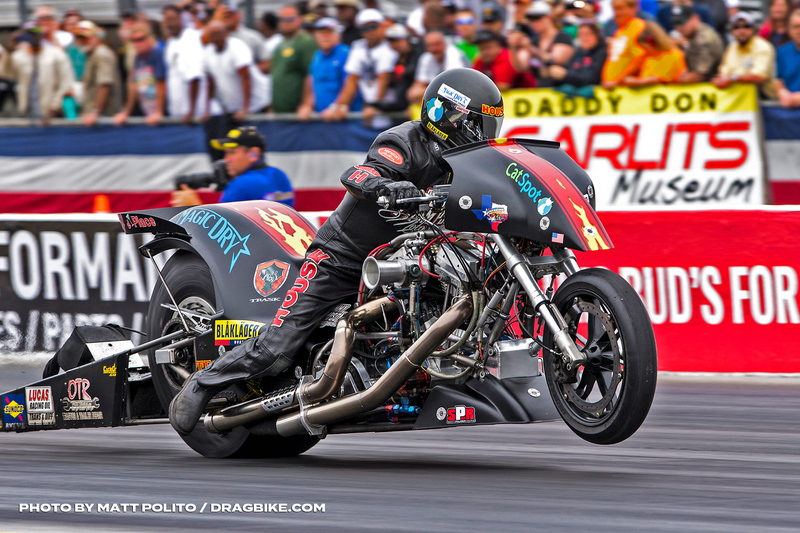 They knew the wheels up Top Fuel Harleys would put on a show. For the first half the race course they did. Then something went away on Bobby Malloy’s bike causing him to slow down. At the start of their race, Bobby got off the line first with a .074 reaction time and Beau Layne was right there with him posting a .076 RT to the starting line tree. The NHRA announcer commented that Bobby was drifting slightly to the center line and lifted as Beau won the round 6.47 to Bobby’s 7.27. This win was Beau’s second consecutive NHRA win in as many races. He is now currently #2 behind points leader Doug Vancil who finished the season as #2 in 2018 and he has no intentions of keeping that #2 plate. Seven events remain on the NHRA, Mickey Thompson Tires Top Fuel Harley schedule. The next race will be April 12-14, in Baytown, Texas for the NHRA Spring nationals, for race #4 of the ten race TFH season with the NHRA. 5:14 p.m. Weather conditions: air temperature 66 degrees, relative humidity 64 percent, barometer 29.85 inches, adjusted altitude 1,168 feet, track temperature 83 degrees. Shigematsu is a no-show. Layne gets the bye run and makes a decent pass. He is going to his second career final round. House gets the advantage off the line but has problems and is out of power early. Malloy makes a decent pass and will be going to his fourth final round. Malloy left some oil on the lane and will be charged five points. Layne will have lane choice over Malloy in the final round. Malloy with a couple ticks on the tree, but Layne chases him down by 400 feet and never trailed from there on for the win. Layne wins his second race in his career, both this year. 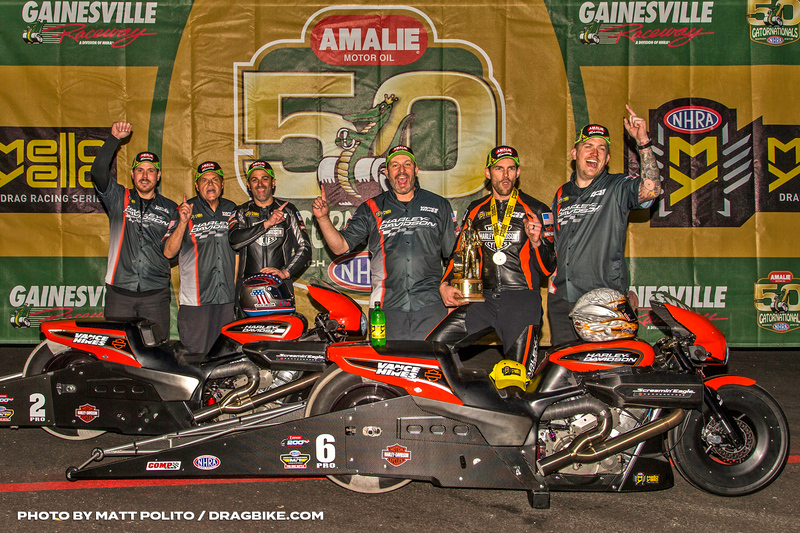 Mickey Thompson Top Fuel Harley Series point standings following the 50th annual Amalie Motor Oil NHRA Gatornationals at Gainesville Raceway, the race is the third of 10 events in the Mickey Thompson Top Fuel Harley Series. On Friday, March 15th, 2019, during the 50th running of the Amalie Motor Oil, NHRA Gator Nationals, presented by JA Service, after 2 rounds of qualifying on Friday, Tak Shigematsu of Japan was sitting in the #1 spot with a 6.10 @ 233 MPH. WOW! Tak Shigematsu makes the quickest run in NHRA Top Fuel Harley history with a 6.101!Amalie Oil #Gatornats#NHRAonFOX tonight on FS1 at 11:30p ET. Qualifying after 2 rounds on Friday yielded: Tak Shigematsu 6.10, Doug Vancil 6.34, Beau Layne 6.39, Tii Tharpe 6.41, Jake Stordeur 6.52, Armon Furr 6.56, Tracy Kile 6.81, Rickey House 7.18 (Bump Spot 8 bike field). TFH Q-3 session: Going into the Q-3 session the eight bike field bump was a 7.18, coming out of the session, the bump lowered to a 6.43 elapsed time, a very stout number to run under. The low qualifier going into the session was Tak’s 6.101 and that number was still standing at the conclusion of the session. But big moves were made by the big dogs. 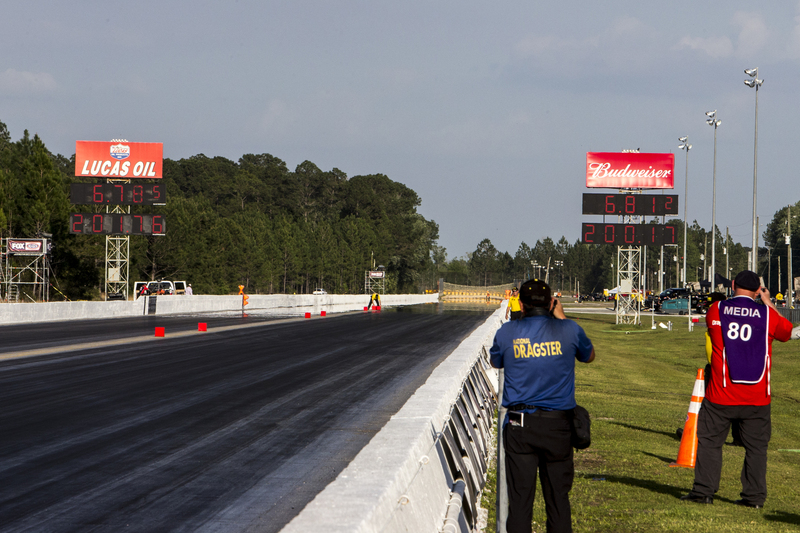 Bobby Malloy was in the number 10 spot after two sessions and he moved up to the #5 slot with a 6.35 @ 217 mph. Rickey House was in the #8 spot at the start of Q-3 and his 6.37 was a vast improvement over his 7.18, but the overall field improved so strongly, his number only moved him up one place to the number seven position. Moving into the bump spot at #8 was Jake Stordeur who has been running hot-straight and true all weekend. Jake’s 6.435 locked down the bump and Armon Furr (6.56), Tracy Kile (6.69), Jay Turner (6.71), Chris Smith (7.51) and Billy Jackson (7.72) are all looking to improve and make the field during the 4th and final qualifying session. The biggest move in TFM qualifying during the Q-3 session was Mike Scott of Calgary, Alberta, CA who had two previous incomplete runs. His 6.32 @ 224 moved him from completely outside the field to the #3 spot on the bottom half of the ladder. TFH Q-4: There were two significant improvements by a pair of heavy hitters during the fourth and final session of TFH. Doug Vancil’s tuner Mike Romine made a change in the tune-up that gave Doug a performance boost, his 6.33 @ 226 MPH improved to a stunning 6.18 @ 237 MPH that caught everyone’s attention. Also Tii Tharp’s bike, was 6.36 @ 222.23 as of Q-3 and it improved to a 6.27 @ 222.77 on it’s final pass, picking up a tenth with a dead-on MPH, clearly Tii is getting everything out of that bike, that Jeremy Hoy, Rex and the entire JTR team can do to the bike. These performance improvements moved Doug Vancil from the #4 spot to the #2 slot on the ladder and Tii moved from #6 qualifier to the #3 spot on the bottom half of the ladder and this affected the pairings for Sunday’s elimination match-ups. These qualifying position improvements are super important in the national championship point’s race for the NHRA #1 plate. The lower the qualifying position, the greater the points rendered for qualifying deep. At the end of the season – every point counts. 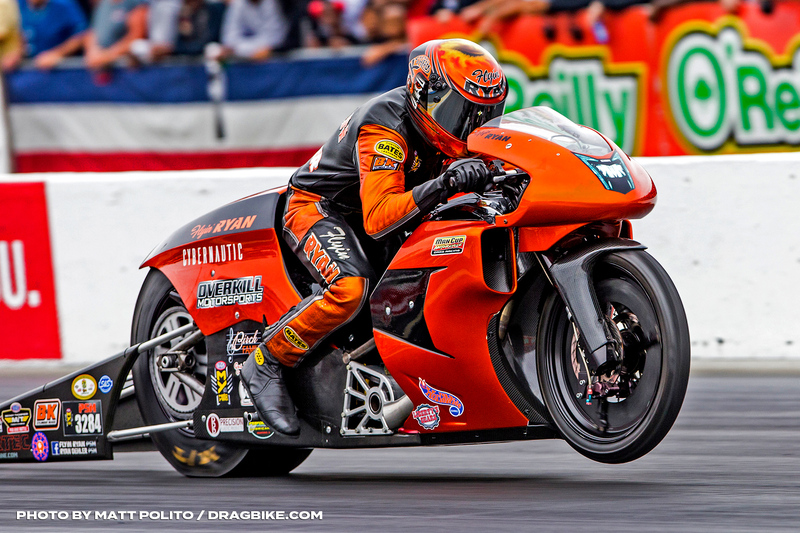 The 8 bike qualified field for the 50th annual NHRA Gator Nationals: Tak Shigematsu 6.10, Doug Vancil 6.18, Tii Tharpe 6.27, Beau Layne 6.30, Mike Scott 6.32, Bob Malloy 6.35, Rickey House 6.37, and Jake Stordeur 6.43 on the bump spot. On Sunday, the pairings are Tak Vs Stordeur, Layne Vs Scott, Vancil Vs House, and Tharpe Vs Malloy. The DNQ’s for this event, the racers who did their best but came up short were; Armon Furr, Tracy Kile, Jay Turner, Chris Smith, and Billy Jackson. 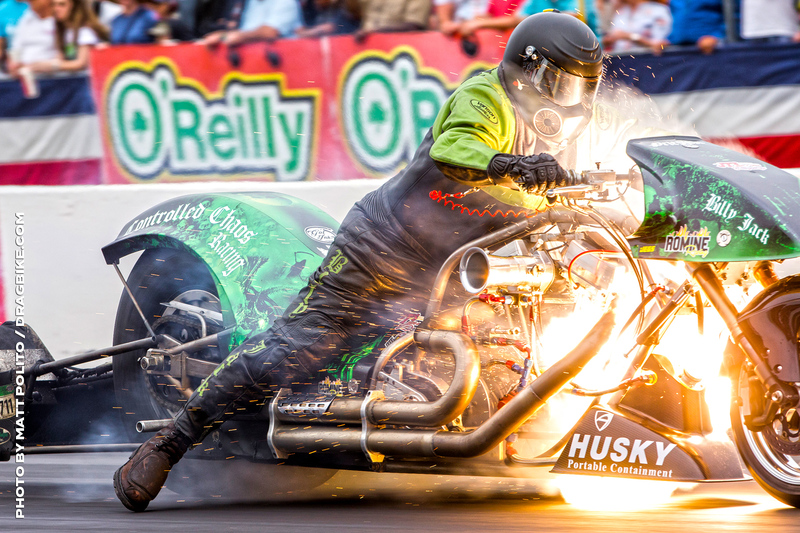 ON SUNDAY, March 17th, 2019, not only will people be celebrating Saint Patrick’s Day, but that evening people will be celebrating the 50th running of the NHRA Gator Nationals, held in Gainesville, Florida. The 50th Amalie Motor Oil, Gator Nationals, sanctioned by the National Hot Rod Association will be a memorable occasion to say the least. Especially for the folks who follow the sport of motorcycle drag racing. It was here one year ago that the NHRA competition classes of NHRA Pro Stock Motorcycle (NHRA PSM) and the class of Mickey Thompson Tires, Top Fuel Harley took to the storied 1320’ of racing surface and thrilled the crowd with the thunder of the big fuel bikes and the lightning-quick NHRA Pro Stock Motorcycles. 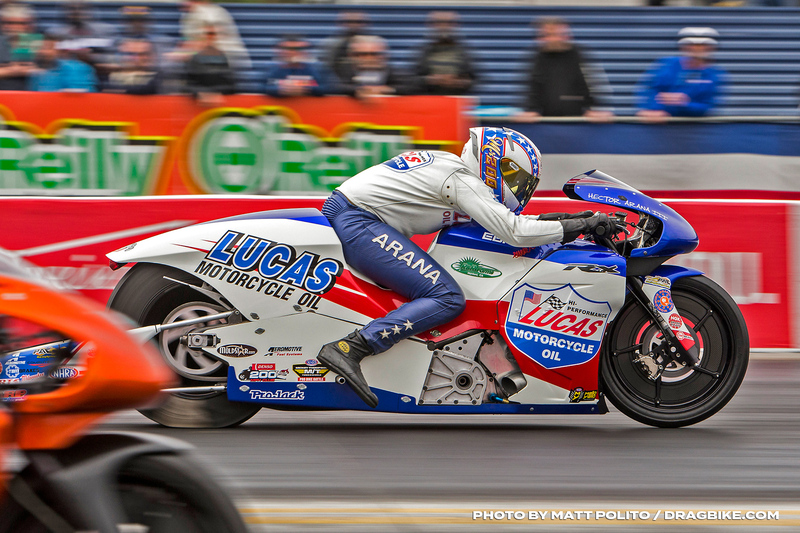 Just one year ago at this event, Hector Arana Jr. brought the NHRA PSM teams into the 200 MPH zone when he posted the first official NHRA bike run, cresting 200 miles-per-hour. He was awarded $10,000 by Denso Spark Plugs for that historic moment, and he qualified 4th for the weekend. The Gators as the event is affectionately known by the faithful, has a very rich history in drag racing in general. This is the home of “The Swamp Rat” our large father, Mr. “Big Daddy” Don Garlits, his museum is just a short ride from the Gainesville race track. Don was the first to crest 250 MPH here in 1975. Some 17 years later, this is also where Kenny Bernstein, piloting the Budweiser King, Top Fuel dragster first broke the 300 MPH barrier in 1992. And that same year at the PROSTAR motorcycle drag racing event, Larry “Spiderman” McBride stepped off his Top Fuel motorcycle at over 200 MPH to avoid colliding with the guard rail in the right lane. Now 27 year later, Larry is still the quickest and fastest man on planet earth on two wheels. I remember from that motorcycle drag race the appearance of the Hubba Hubba racing Top Fuel Harley built by Andy Gotsis and George Smith Jr. of S&S Cycle’s fame. That blown and injected TFH was the loudest drag bike I ever encountered and seeing it go close to 4.0 at over 190 MPH in the eighth, breaking the chain, before half-track: I knew this team and this motorcycle were headed for glory. And in May of 1994, they ran the first 200 MPH pass by a Top Fuel Harley. Gainesville Florida, home of the Gator Nationals, it’s a historical, magical place where legends are forged and history is written. 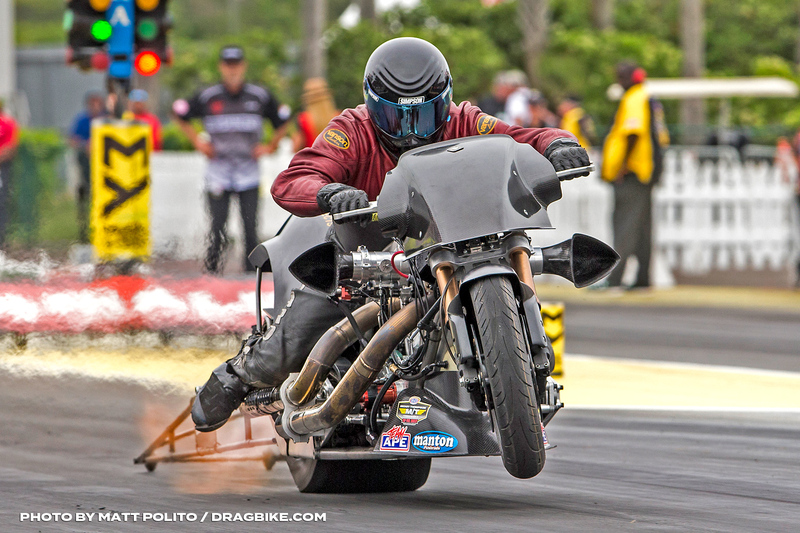 Coming into the 2019 Gator Nationals, for the motorcycle drag racing contingent, there are 23 drag bikes entered into the Pro Stock Motorcycle class. They are vying for a spot on the 16 bike competition ladder to race on Sunday. Eddie Krawiec, who has won the Gators 5x is the man to beat at this event. He defeated his teammate Andrew Hines here last year for the win, his MOV was a mere .023 seconds. 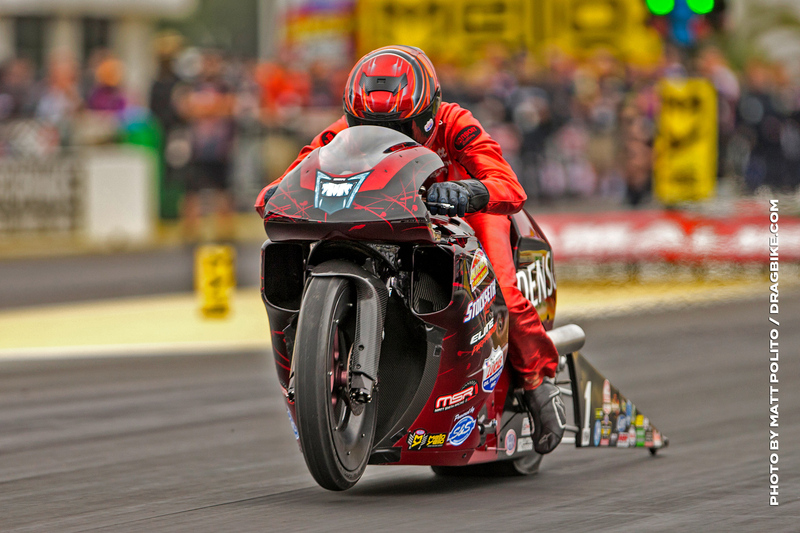 In the NHRA, Mickey Thompson Tires, Top Fuel Harley class, as of the Tuesday prior to the event, 16 Top Fuel Harley motorcycles are pre-entered including Tii Tharpe, the winner of the 2018 event. He defeated Bobby Malloy last year 6.31 to 6.54 for his second win in as many races entered. Tii then went on to become the NHRA TFH champion of 2018. The TFH motorcycles will begin qualifying on Friday, as will the PSM bikes, in the afternoon. There are two sessions slated for Friday and two more on Saturday, to round out qualifying. The TFH bikes will be competing off an 8 bike qualified ladder, the first alternate rule will be in effect. Sunday the begin eliminations at 11AM, EST.